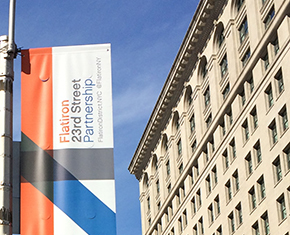 The Flatiron/23rd Street Partnership Business Improvement District, formed in 2006, is a nonprofit organization whose mission is to enhance the area's reputation as one of New York's most vital and exciting neighborhoods. Car Free Earth Day is an annual car-free event, which will be held this year on Saturday, April 27th, the Saturday immediately following Earth Day. Enjoy thirty open blocks of Broadway from Times Square to Union Square on foot during event hours, 9 am to 3 pm. The day features all types of fun including complimentary Citi Bike day passes, free fitness classes from studios like exhale Flatiron, dance performances, a pop-up parkour playground, free skate rentals, a musical themed historic walking tour, and booths to learn about organizations working toward environmental sustainability. See you on Saturday! (Check out full citywide programming roster here). Citi Bike Experience: Stop by the Citi Bike booth on Broadway & 22nd Street to learn about Citi Bike and sign up for a membership. New and existing members are eligible for a special gift on 4/27 only! In celebration of Car Free Earth Day, all visitors will get a complimentary Day Pass! WRKNYC FITFAM Bootcamp: Join WRKNYC for an outdoor WRKout for the community. Our family-friendly Bootcamp will include all body-weight exercises that welcome all fitness levels! Functional Fitness with PopFit Kids: Get ready for an action-packed healthy adventure with high-energy fitness fun and good-for-you games that kids can share with the whole family. Through high-energy circuit activities, dynamic drills, obstacle course play and more, this session will get kids moving and hit on the PopFit Five: Cardio, Strength, Flexibility, Balance and Endurance. Exhale Barre plus Cardio with Rachael Leitson: Break a sweat, and have fun in all in one intense, efficient, barre-meets-cardio class. Vibrate Higher’s Vinyasa Flow Yoga Class: Lead by expert yogi and Founder of Vibrate Higher and Vibrate Higher Foundation, Sandra Thelusmond, this class includes all levels of invigorating and strengthening vinyasa flow, which blends core work, power holds, arm balances and creative sequences. Participants also receive a free gift from the Vibrate Higher brand. Fogo Azul NYC is NYC’s favorite all women drumline, 90 members strong! For years, women were forced to dance, while the men drummed. Fogo Azul NYC breaks this stereotype and strives to make drumming accessible to all female-identified individuals. Find them on social media as “Fogo Azul NY”. Overflow and Visioning Bodies: Artichoke Dance Company, one of the nation’s leading eco-arts performing groups, presents highlights from their water-focused series of works. "Overflow", created in response to Hurricane Sandy, reflects oceanic currents and rising tide patterns. Parkour & Play with The Movement Creative: The Movement Creative will build a pop-up parkour playground that encourages family-friendly, creative movement via a unique obstacle course that will challenge balance, strength, jumping, and climbing skills. Our experienced coaches will share their favorite movement games and skills while providing individualized challenges. Go! Sports Inline Skate Y Skateboard Rentals and Clinics: Go! Sports USA will provide free skate rentals and "Learn to Skate" clinics at its #SkateStation for #CarFreeNYC 2019. As a licensed Department of Education vendor, Go! Sports USA runs year-round sports and media arts programming in schools across NYC. Whether you are thinking of the Ashcan Artists of the early 20th century or the punk rockers of the 1970s, New York is a city that has been on America’s cutting edge for over a century. Join us as we explore New York’s cultural edge beyond Greenwich Village, from the site of Stanford White’s 1890 Madison Square Garden (and where he was murdered) to Bill Graham’s “Church of Rock and Roll". Along the way, we will explore the many waves of artists, musicians, and cultural figures who have found creative expression in the City. Stops could include The Palladium/Academy of Music, Paresis Hall, the 69th Regiment Armory, and Max’s Kansas City, as well as sites associated with Alfred Stieglitz, Patti Smith, Led Zeppelin, and Evelyn Nesbit. (Tours may accommodate a maximum of 30 individuals. Please arrive early to secure your spot). Engage in Solutions to Climate Change: Learn the solutions to Climate Change and participate in the workshop, “Write Your Member of Congress”. Citizens’ Climate Lobby creates the political will for climate solutions by enabling individual breakthroughs in personal and political power. El-Space: Creating Dynamic Places Under the Elevated: Design Trust for Public Space has partnered with the New York City Department of Transportation (DOT) to enhance, activate and reclaim spaces under or adjacent to elevated bridges, highways and subway and rail lines citywide. Earth Day Initiative’s Do Just 1 Thing: Earth Day Initiative’s Do Just 1 Thing program empowers people to take positive environmental actions in their own lives and share their own sustainability stories solutions they see or would like to see in their own lives. Come check out how you can engage and make a positive impact as we count down to the 50th anniversary of Earth Day in 2020. Time Traveling through NYC’s Climate History: Throughout geologic time, water has moved from the world’s oceans into the ice sheets and then back again from the ice sheets into the world’s oceans. Each time this occurs, sea levels change, causing the climate and living conditions to change as well. Look into New York City’s climate history to discover what life would have been like in different climates and time periods. Bioluminescent Fireflies: Hk Summer STEAM (Science, Technology, Engineering, Art, Math) is a full-day summer enrichment program during which our HYPOTHEkids conduct experiments, create projects, meet practicing scientists and engineers, and take trips based on the theme of the week! Come get a taste of summer during Car Free Earth Day! Play Fair for Parks: Learn more about New Yorkers for Parks’ new Play Fair campaign for parks! Participants will learn more about how to engage in park and open space advocacy, and how to reach their decision-makers. NY4P is also soliciting public input into the design of our new District Profiles, a citywide resource that provides data about open space and park access for every neighborhood in the five boroughs. SDG’s in My City: The UN Sustainable Development Solutions Network (SDSN) aims to eradicate poverty and deprivation, but also to grow our economies, to protect our environment, and to promote peace and good governance. As part of Car Free Earth Day, SDSN will run an interactive booth where the public can engage with the Sustainable Development Goals (SDGs). The booth will offer fun activities for all ages, including educational resource giveaways. Our booth will feature a spinning wheel with all 17 SDGs and participants will receive an invitation to partake in a personal practical behavior change activity. The Wildlife Conservation Society New York Seascape Program: The WCS New York Seascape Program addresses pressing marine conservation issues within the 16,000 square miles of ocean from Montauk, New York, to Cape May, New Jersey, and the Long Island Sound. The New York Seascape program's objectives are to restore populations of depleted marine species (currently sharks, whales, and American eels), protect key coastal and offshore habitats, and inspire and build a diverse, vocal constituency for marine conservation. April brought new life to the Flatiron District with blooming flowers and exciting developments. Media highlights include the debut of a new omakase restaurant on 28th Street and a dim sum spot on East 23rd Street, shout outs for the impressive food offerings at several dining spots, and the growing trend of residential building construction projects. Stay up to date with the latest Flatiron District News with our monthly roundup of notable highlights. It may be spring, but "winter is coming" for Game of Thrones (GoT) fans in the Flatiron District. The original Shake Shack in Madison Square Park served up a thematic secret menu in celebration of GoT's premiere of the show's final season. The menu items included a Dracarys Burger through April 21st and a Dragonglass milkshake available through May 19th (via Complex Mag). A new omakase (a chef curated sushi experience) spot, Noda opened at 6 West 28th Street where you can “taste a little bit of Tokyo without flying for 14 hours” (via Grub Street). If you're hungry for noodles, Xiang Xiang Noodle, a dim sum spot serving a variety of noodle dishes, and soups debuted at 110 East 23rd Street (via hoodline). Square pizza slices are gaining popularity and Eataly Flatiron's Alla Pala was named to be one of the City's best. Head Baker Erin Flinn shared a secret to Alla Pala's success: “The flavor of our dough is the base of the flavor of our pizza, rather than looked at as a blank canvas, as is the case with many pizza doughs” (via New York Post). Chef Daniela Soto-Innes of Flatiron's Cosme and NoHo's Atla, was named as a James Beard finalist for best chef in New York City (via Patch). Popular Flatiron whiskey bar Maysville announced it will close its doors on April 21st (via Eater NY). CBS signed a 15-year deal to renew 164,000 square feet at 28 East 28th Street (via New York Post). The Zucker Organization sold the 50,000-square-foot parking garage at 41-47 East 21st Street to Mequity Companies for $32.2 million (via Globest). Meridian Capital Group has arranged a $138.6 million ground-up construction loan for a 48-unit luxury condo property at 39 West 23rd Street that features a 24-story tower on West 23rd Street and a smaller 10-floor tower on West 24th Street, as well as one retail unit (via Multihousing News). Headquartered in Flatiron, Yext was named number two on the list of Top 10 Companies in Tech for Millennial Women in 2019. "We foster a diverse and inclusive environment because it's fundamental to our long-term success," said Elizabeth Walton, Vice President of Marketing at Yext (via PR Newswire). During Car Free Earth Day on April 27th, a series of activations and performances will occupy six different rest stops including one in the Flatiron District at 23rd Street and Broadway (via TimeOut New York). The Flatiron Building transformed into a giant slice of pizza (via The World News) and a landing spot for Game of Thrones' dragon Viserion (via Variety) thanks to two exciting Snapchat filters this month.